If you're like me, and you have a 'little' trouble with reading small type, you might be looking for a Bible that's easier to see and read. NIrV Giant Print Holy Bible is a large hardback Bible with a font size of almost one-half centimeter (14-point type). The clear font and single-column text combine to make this Bible much easier on the eyes for beginning readers, ESL readers, and readers with vision impairment. The NIrV translation is based on the New International Version. It has been condensed to include shorter words, shorter sentences, and shorter chapter sections with titles. It also includes references when verses are quoted from another place in the Bible. If more than one name for a person or place is used in the Bible, the NIrV translation uses just one. 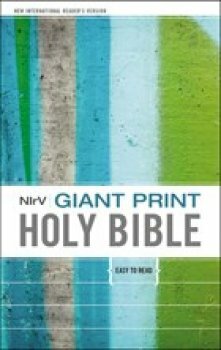 For instance, the Sear of Galilee is called by different names in the New Testament, like the Sea of Tiberias and the Sea of Gennesaret, but in the NIrV Giant Print Holy Bible, it is called the Sea of Galilee every time. Specific names are also used for clarity, like the Euphrates River instead of just the River. These features not only help aid in understanding for any reader, but they also make this Bible perfect for new Bible readers to master. Pages are thin and type shows through from other side, making the print not as clear as it could be. Overall, I have a good impression of this Bible, but for the $30 price, I would like to see a heavier weight paper for the pages and a few more extras--at least maps--inside.